So this moisturizer has been somewhat life changing for me (not to be overly dramatic…but really). I found the recipe in February and have been making various versions ever since. I no longer buy lotion, it is that good! It calls for all natural ingredients (yay!) that are easily found in your kitchen pantry (well, maybe with the exception of the beeswax). I suffer from dry skin (especially on my hands) in the winter, to the point where they become cracked and painful and just generally unpleasant. I am a persistent handwasher (I work in health care), so this only adds insult to injury. This moisturizer is great because it functions, not only like a lotion, but also like a soothing salve. Even better, it takes a few soapy hand-washes to come off of your hands completely, which means it stays on as a moisturizing, protective layer even longer than many normal lotions. It is easy to make and a little goes a long way! 1. Place all of the ingredients in a glass storage container (I use recycled nut butter jars) and then place the container in a pot filled with about 2 inches of water. 2. 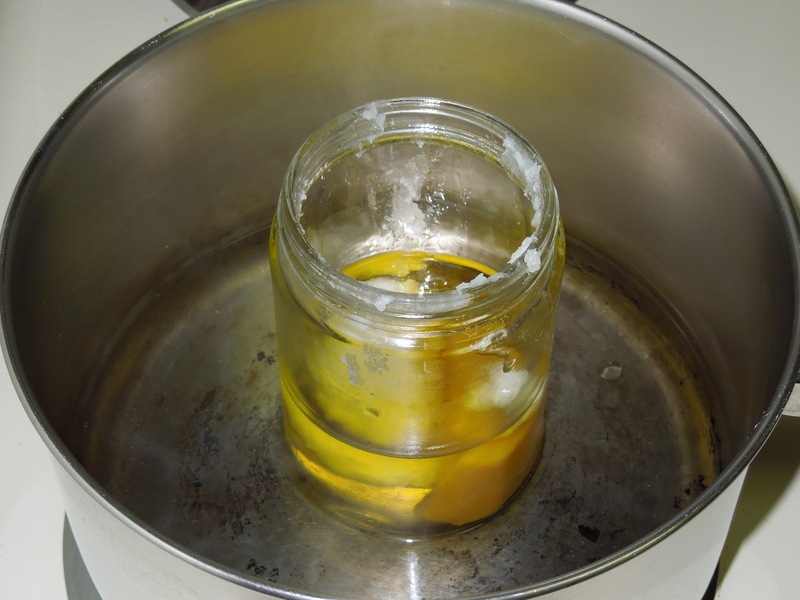 Turn the burner on to medium heat and over the next 30 minutes, stir the contents of the jar until the beeswax is completely melted. 3. Make sure all of the ingredients are stirred to the point where there are no chunks or stray pieces of wax. Turn off the burner and allow the jar to cool completely. Once it is cooled to a more solid form, it is ready to use! I used this recipe last weekend to whip up my own batch of moisturizer! I left out any extract or essential oil for scent because the ingredients already have a nice mellow scent on their own. This moisturizer is great – it lasts all day (I use it on my knees and elbows and any dry patches as well as my hands) and after only a few days my skin is feeling lovely. I did have a little trouble measuring the beeswax and probably added too much creating a more firm mixture. Heating it up a bit makes it more applicable and enjoyable on a cold winter morning though! I’ll definitely be experimenting with future batches. Thanks, Brie!